Senior Brad Newman, #2, was the had a career best performance at Thursday's game, scoring 41 points. File photo from a game against Missouri Baptist earlier in the season. Off the heels of a wild road trip where they went 1-1, the Men’s basketball team returned to the friendly confines of Hyland Arena where they played in yet another thriller, this time against the Central Oklahoma Bronchos. The two MIAA rivals battled all the way through regulation to force overtime, but it was Lindenwood that came out on top thanks to another stand-out performance out of senior guard Brad Newman, who had a career-high 41 points. Neither team was interested in missing in the first half, with both teams shooting over 50% from the field to get the game started. Lindenwood got off to a hot start, going on an 18-8 run in the first seven minutes which was capped off by a fastbreak layup by Newman. Central Oklahoma was getting little separation from a tight Lions defense, forcing them to continue taking contested looks which led to 33% shooting in their first 12 shots. In need of a spark off the bench, Central Oklahoma senior guard Josh Holliday made his entrance and did it emphatically. Holliday had 17 first half points on 87% shooting, launching the Bronchos’ comeback effort to put them ahead by two with a few seconds remaining in the half. Enter Newman. 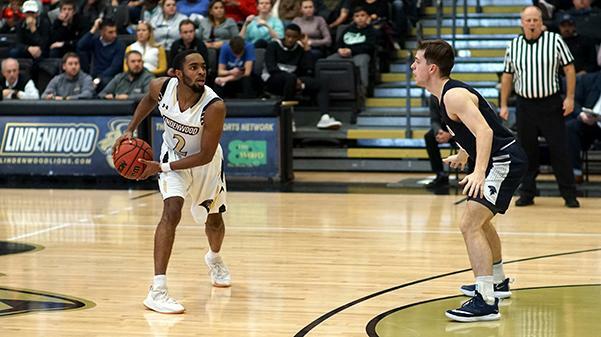 Lindenwood’s senior guard, who had already tallied 18 points in the opening 20 minutes, got free from the Central Oklahoma defense and drilled the buzzer-beater. Newman’s three pointer gave him 21 on the half, and gave the Lions a one point lead heading into the halftime break. Lindenwood would get off to another strong start in the second half, going on a 13-6 run after four minutes. But the Bronchos would continue their all-around efficiency on offense, putting the visitors just out in-front of the Lions at 67-65 with five minutes left to go in the second half. About 15 seconds later, it was Holliday again for the Bronchos, knocking down his fourth shot from beyond the arc to give his team a 70-65 lead. The two sides would go back-and-forth up until the 19:30 mark of the half, when Central Oklahoma’s Marquis Johnson hit one of his two free-throws to put the Bronchos up by four. Newman gave the Lions hope, converting a three-point player after making his layup despite being fouled, then knocking down his free throw. Central Oklahoma would make it a three-point game after a successful trip to the line for their sophomore guard Jordan Hemphill. Lindenwood, with 13 seconds, needed a clutch bucket more than ever, and the usual hero stepped up once more. With seven seconds remaining, Brad Newman got the ruckus Hyland Arena crowd on their feet with a game-tying three to send the game to overtime. Newman finished with 16 points in the second half and 37 total after the end of regulation. The overtime period saw both teams excel on the defensive end. Through the first three minutes, there was only one score for either team, and the bucket came on a Ashford Golden jumper for Central Oklahoma. That would be the last bucket for the Bronchos until a last-second layup by Jordan London, as Lindenwood’s defense was stout for the remainder of overtime. 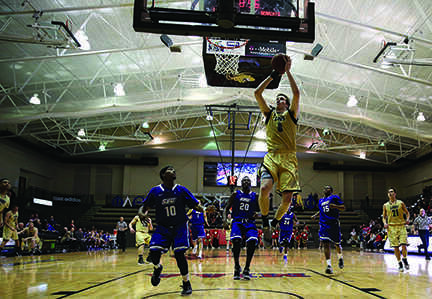 Lindenwood’s strong defensive play gave their offense a chance to pull ahead, and that’s exactly what the Lions did after a Chris King layup saw them take the one-point advantage. The Lions shot 6-8 from the line after King’s score, seeing them through the rest of overtime and take home the 85-80 win. The Lions improve to 11-9 overall, and 4-4 in MIAA play. Lindenwood will look to get over the .500 mark on Saturday when the Northeastern State Riverhawks come to town. The Non-Experts: ‘Cardi’ in the U.S.A.